Emilia grew up in a town near Buenos Aires. 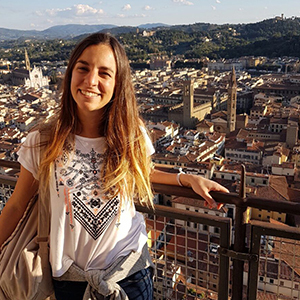 As a teenager she discovered her passion for travelling and learning from different people and cultures. While traveling she became determined to use communication for social good by making the invisible visible. That is why she studied Social Communications at Austral University (Buenos Aires) and did an exchange program in Sciences Po (Paris). She also volunteered in different organizations, related to education, housing and wellbeing. For four years, Emilia worked at Ashoka, an international NGO supporting social entrepreneurs with the message that “everyone is a changemaker.” Through her work with Ashoka, she helped different social projects deepen their impact by building communication strategies and connecting them with key partners to grow and make their social causes visible. She now looks forward to deepening her skills as a leader and intra/entrepreneur to work with arts and communications for social impact.